Proposed facility to address rise in travelers while increasing revenue for city. Less than a year after opening an eightstory, 210-room hotel in the Irvine Spectrum, R.D. Olson Development has proposed building another hotel right next door. Plans for the property call for a 15-story, 250-room full-service Marriott. It would cater to increasingly particular visitors with amenities like a rooftop bar, valet service and cabanas by the pool. Doing so would cost of “just north of $100million,” said R.D. Olson’s Jonathon Vopinek, vice president for asset management. Bookings are “off the charts” Monday through Wednesday at the Courtyard, he said. Before the Courtyard’s opening, Irvine last saw a new hotel open in December 2009. During the recession, two sources of income made up the majority of the money that the city of Irvine took in each year: sales and property taxes. But before the slump, there was another significant contributor: hotels. The “big two” is back to being the “big three” again, Mayor Pro Tem Jeff Lalloway said recently. When the Hilton Garden Inn John Wayne Airport hotel opens in the near future, that will boost room inventory in Irvine by 5 percent. The five-story property on Morse Avenue will add 170 rooms to the city’s supply. The hotel is taking reservations starting Aug. 12. Plans for the Irvine Spectrum Marriott are undergoing review by city planners. A city commission will get final say on the project. At the moment, landowner Irvine Co. is in the process of selling the land – a current parking lot – to R.D. Olson, company spokesman Bill Lobdell said. While the hotel would be full-service, it won’t be as luxurious as a J.W. Marriott , the chain’s higher-end properties. If approved, the configuration of the Courtyard and the newer hotel would make up a complex of sorts, with a passageway between the buildings’ ballrooms. Vopinek said the proposal’s timing anticipates growing demand in the area. Next year, the Irvine Co. plans to open a 21-story office tower at 200 Spectrum Center Drive. The firm has also proposed building a second high-rise nearby. A few miles away, tech giant Broadcom, now under the ownership of Singapore-based Avago Technologies, is moving forward with a 2million-square-foot corporate campus. If approved, Vopinek said construction could start as soon as November. Tentatively, the hotel could open in summer 2017. With it would come about 125 new jobs, he said. 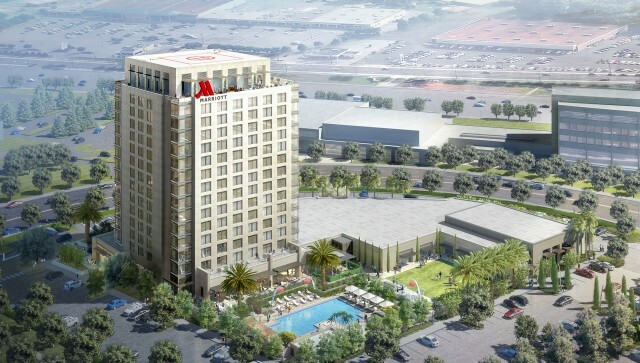 This rendering shows the 250-room high-rise hotel proposed to be built in the Irvine Spectrum, next to the 210-room Courtyard by Marriott that opened in 2014. 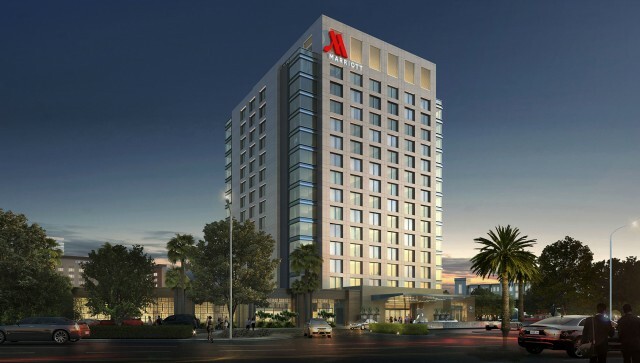 The Irvine hotel will feature 250 rooms to meet the needs from rising number of executive travelers.